The Force will be strong with retailers of the latest "Star Wars: The Force Awakens" merchandise set to go on sale at 12:01 a.m. Friday, September 4. Dubbed "Force Friday," the global event kicked off with the "unboxing" live stream on the "Star Wars" YouTube channel. Spanning 18 hours and 12 countries, the video rollout showcased the latest toys from manufacturers such as LEGO, Hasbro and Disney being unveiled and then "unboxed" for audiences. The live stream was also the first time shoppers actually got to see what merchandise would be available. Like the movie, which hits theaters on December 18, the latest "Star Wars" toys were a heavily guarded secret. "Star Wars toys have always played an important role in how our fans interact with the Saga," said Lucasfilm President Kathleen Kennedy in a statement. "They've inspired multiple generations to relive the experience of the movies and to create new adventures all their own. 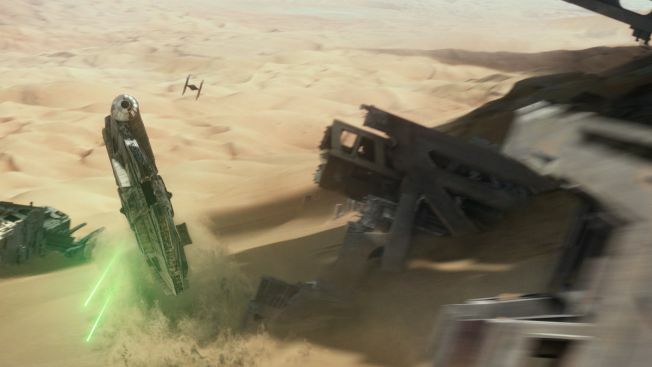 These spectacular 'Star Wars: Force Awakens' productions will continue that tradition." Amazon.com: The online giant will celebrate by offering customers access to a variety of new "Star Wars" products, including Amazon exclusives, as well as deals on select "Star Wars" items. Amazon will also be hosting a giveaway of the "Star Wars" Legendary Jedi Master Yoda, Collector Box Edition on Facebook. Disney Store: Disney Store locations in New York City in Times Square, Chicago on Michigan Avenue, and San Francisco on Stockton Street will participate in "Force Friday" midnight madness. Doors will open at 12:01 a.m. local time on September 4. The first 1,000 guests will receive a free "Star Wars: The Force Awakens" D23 commemorative fan poster. All Disney Store locations throughout North America will open for business on "Force Friday" with "Star Wars"-themed opening ceremonies, and offer special deals such as a free commemorative "Star Wars: The Force Awakens" pin for the first 100 guests who make a "Force Friday" purchase. Disney Parks: Starting at midnight at the World of Disney store in Disneyland Resort’s Downtown Disney District and Once Upon a Toy in Walt Disney World Resort’s Downtown Disney Marketplace, fans will have first access to new products and parks-exclusive merchandise, including a "Force Friday" logo messenger bag. Target: 207 Target stores will open at midnight on September 4, with all the new "Force Awakens" items available and more. Visit Target.com/starwars to locate a store near you. Toys"R"Us: All Toys”R”Us stores will open at midnight, with special giveaways including a limited edition LEGO "Star Wars" Commemorative Brick and an exclusive "Star Wars" poster, while supplies last. At Toys”R”Us Times Square in New York City, fans can join a "Star Wars" party. Festivities begin on Thursday, September 3 at 9 a.m., including book signings, art classes and product demonstrations. Walmart: Participating Walmart stores will also be opening their doors at midnight on September 4. The retailer will be the only place to find Topps’ Galactic Connexions, a trading disc game featuring the "Star Wars" characters. Customers visiting Walmart stores on September 4 will receive a free two-pack of Galactic Connexions discs, including a rare blue star field disc that will only be available in packs given away on "Force Friday."